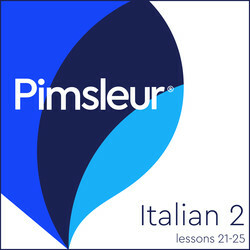 Pimsleur includes 5, 30-minute audio lessons as streaming or audio download. Can learning another language be as easy as speaking your own? 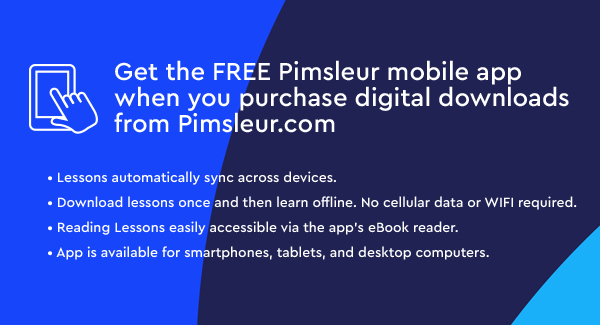 Yes with Pimsleur it’s that easy. Learn on your own time, at your own pace, and wherever you choose. This course includes Lessons 21-25 from the Italian Level 2 program featuring 2.5 hours of language instruction. Each lesson provides 30 minutes of spoken language practice, with an introductory conversation, and new vocabulary and structures. Detailed instructions enable you to understand and participate in the conversation. Practice for vocabulary introduced in previous lessons is included in each lesson. The emphasis is on pronunciation and comprehension, and on learning to speak Italian. Italian is the official language of Italy and San Marino, and one of the official languages of Switzerland, Croatia, and Slovenia. Italian is spoken by about 58 million people in Italy, 24,000 in San Marino, 840,000 in Switzerland, another million in other European countries, and approximately 5 million in North and South America. Historically, Italian is a daughter language of Latin. Italian uses the Roman alphabet and the pronunciation of the language follows the spelling very closely.